If you find that space is at a premium in your home, bespoke alcove furniture offers a beautiful solution. Intelligent alcove furniture can totally change the way you use your living space, helping to maximise the potential of every room. Our alcove cabinets come in a variety of styles and formats - as stand alone units or combined with bookcases or floating shelves fitted above. 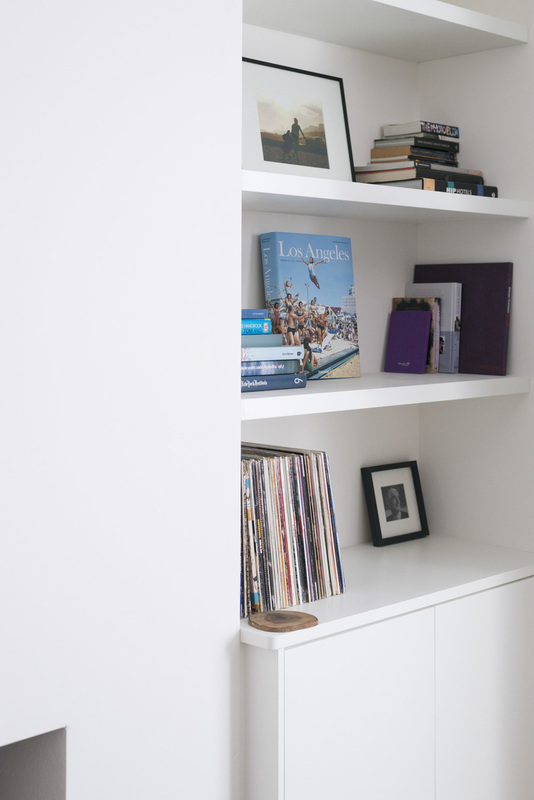 Whether you have an awkward internal architecture, or need to incorporate specific storage, we tailor each piece of alcove furniture to seamlessly fit your home. From the carefully sourced wood we use, to the superior range of handles and knobs we fit, our alcove furniture can be designed to fit, or enhance, any aesthetic. Fitted in Walthamstow in 2016. Crisp, clean lines are a feature of this design. A neutral design will display your library to best advantage. We source quality materials from sustainable sources to build beautiful fitted furniture. To make our alcove cabinets, as with all our other fitted cabinets, panels are first cut to size on our big saw, then planed and the edges machine sanded and rounded very slightly to remove the sharp edges. Cabinets are then jointed using wooden ‘biscuits’ and fixed together. Our Shaker and Victorian style panel doors are handmade in the traditional way, but we also utilise modern processes and materials in their construction. Solid wood & real wood veneered tops like this one in natural Oak add warmth & interest. Specific customer requirements for alcove cabinets are, as with all of our bespoke furniture, accommodated within the design with ease. Matching existing materials, flooring or wall colour. Incorporating specific storage needs or existing audio-visual equipment. Providing discreet power and connectivity to equipment housed within or on the furniture. Fitted in green lanes, north london. Our craftsmen can input solid wood cable sleeves & covers, sprayed to match the top, to keep wires organised and workspaces clean. Projected tops are gently rounded to soften visually, as well as being more child, and home, friendly. All our handmade alcove cabinets perfectly marry aesthetic appeal with functionality. Fitted flush for clean lines, our alcove cabinet doors are fitted with discreet touch latches manufactured for us, in Germany. Equipped with soft buffers, all our doors operate smoothly and quietly. All you need to do is tap. Electrical sockets can be re-sited inside your cabinets; and all our cabinets are neatly fitted to the walls using shaped infills, finished off with a flexible gap-filling sealant. Read more about our unrivalled fitting service on our How It Works page. Our fitted alcove cabinets aren’t just storage, but gorgeous design pieces handcrafted for your home. Call us on 01233 732504, or email us at info@milkwood-furniture.com to ask us what we can build for your home.